So, we know WHY sleep is important for both adults and kids alike. Now the question is how? My sleep coach has set me up with a day by day plan for the next 3 weeks (yes 3- it takes 21 days to break a habit!) to help by girls get more restful sleep, and by proxy, me too! Here is the general gist: we created books of the girls doing their sleep tasks, with a reward in the morning if they follow through with their tasks AND stay in bed and lay quietly. Rewards at the beginning were focused on night time routine, doing it well without complaint, then moving on to the night time and morning wakings. We have a sunrise clock in our room so the girls know when it turns orange they can get up and call for me. Night 1: Surprisingly it went relatively well. The girls were excited that they were doing something new. Night 2-4: TERRIBLE. More wakings in the night, less sleep for all, I felt hungover, the girls were cranky. My thoughts, just get through it, there is a plan. We are not unique in this situation, and it’s normal for the girls to have an adjustment period. But it still sucked. Nights 5-7: Better. A few call outs in the night but girls asleep in minutes. Didn’t have to go in to settle them. Mornings have been early (waking between 5 and 6) but I am told this part is the last piece to come. Nights 7-10: Better still. One bad night- a test I think to see if the new routine was legit- the next night though, a full sleep through. The process is still ongoing for the next few weeks but the plan is the same. Bed time is set, a 30 minute routine of brushing teeth, potty, stories, tuck-ins and a quick snuggle. Morning time they can call for me when the light says to (this is still a work in progress). Overall the kids are getting more solid sleep and I am too. I will take a full sleep from 10-5am than broken sleep any day. The sleep coach also says this will start to lengthen but generally at the 3 or 4 week mark. So far she has been right, so I have faith this will be the case for us too. So far this decision to follow through with changing our sleep habits has been amazing. I am so happy to have embarked upon this journey- AND can’t believe I waited so long! Detoxification: Glutathione is a powerful detoxifier. This is a great adjunct to a bi-annual seasonal detox. It gets your liver in to great shape! Powerful antioxidant: Glutathione is the only intracellular antioxidant found, which means it acts inside the cells. It helps the cells resist disease by neutralizing free radicals and keeping other antioxidants, including Vitamin C and E, in their active form. This protects cells from all kinds of toxins and disease states. Aids in fertility: Glutathione aids in improving sperm quality, including DNA fragmentation. Aids in post radiation recovery in cancer treatment: Not only does it help in post radiation fatigue, but it has been shown to aid in DNA repair of healthy cells after radiation treatment has ended. Skin health: Glutathione as an IV form helps in evening skin tone and lessening age spots, allowing your healthy glow to shine through. Naturopathic care in the treatment of patients with cancer has many benefits. It’s something I feel very passionate about. Receiving a diagnosis of cancer can be one of the most life changing and scary experiences a patient can go through. The good news is that there are many things a patient can do to help themselves in the journey to recovery. The naturopathic approach in treating cancer is related to improving the whole person by addressing inflammation, the immune system and looking at what things can impact the cancer directly. This is done through supplements and IVs that can have a positive effect on chemo agents and radiation protocols. Many things can be used in conjunction and have been shown by documented and clinical evidence to be supportive to improve pain parameters, nausea, appetite, etc. One can expect to make diet changes, take supplements and often do Intravenous Therapy or other injection therapies as part of their naturopathic care. It is a lot of work but it is worth it. Dietary changes vary depending on the cancer and also on the patient. This can be anything from a higher fat ketogenic diet to a vegan diet depending on what is required. It is not a one size fits all approach. Supplements are also tailored to the individual and the type of cancer as well. There is a plethora of things on the internet and advice from others that can make your head spin. What is used here at the clinic are supportive supplements with best evidence that match the individual and the type of cancer. Intravenous therapy is a big part of the program too. IV Vitamin C is often recommended along with mistletoe therapy during chemo to aid in side effects, quality of life and both also enhance the immune system. Glutathione IV might be recommended post chemo to help in DNA repair and energy recovery. There are also many options in this arena too depending on what is going on with the individual patient. All in all naturopathic care can be very helpful in managing the cancer process and the cancer journey. Fertility issues can be complicated and can make one feel out of control, working on diet is one way to feel like you have some control and some say in how you are proceeding forward in managing your fertility issues. Going gluten free: Undiagnosed celiac disease may be the reason for “all cause” infertility in 3.5% of women, and unexplained infertility in 5.9% of women. I see clinically, a higher rate of success with women AND men who remove gluten from their diet. Celiac disease is often under diagnosed, as is gluten sensitivity. This makes a huge impact of chances of conception. Avoid food sensitivities: As with gluten, undiagnosed food sensitivities can be problematic. The reason that both gluten and food sensitivities can harm your chances is two fold. Both cause significant inflammation in the body, which tells the body that it’s in danger. When the body is under stress, it’s not thinking about conception, it’s thinking about repair. Food sensitivities also can create malabsorption, which leads to nutrient deficiencies. An inflamed gut is not going to lead to proper digestion and absorption of nutrients, which makes you less likely to conceive, or maintain a pregnancy. Get rid of the bad bugs! (manage gut dysbiosis- Candida and SIBO): Both Candida (yeast) and SIBO (Bacterial overgrowth) can affect the methylation pathway in the body. This in turn will affect ability to conceive. Folic acid is not converted properly which is needed for proper cell division in females. In males this often manifests as sperm DNA fragmentation. This means the genetic information that is given to the egg is not intact, often leading to a non-viable embryo. All the above may sound doom and gloom, but the good news is, with a little effort on changing dietary habits, eliminating any bad bugs in the gut, your success rates will likely go up! As the sun starts to shine in full force, we need to remember sunscreen! Our skies are not like they used to be and more rays are getting through than ever before. Think about this: You put sunscreen almost all over the body! In summer we wear shorts, tank tops, bathing suits, etc. What you put ON your body is also somewhat what you put IN your body. Misleading SPF. Most people choose high spf, which doesn’t necessarily provide that much more protection. The trick is applying sunscreen more often and apply a thick layer. oxybenzone, a synthetic estrogen that penetrates the skin and can disrupt the hormone system. vitamin A (retinyl palmitate): test data shows more skin tumors and lesions on animals treated with this ingredient and exposed to sunlight. Look for labels that include zinc oxide or titanium dioxide. Zinc oxide is Environmental Working Groups (EWG’s) first choice for sun protection. It is stable in sunlight and can provide greater protection from UVA rays than titanium oxide or any other sunscreen chemical approved. The mineral compounds are stable in sunlight, offer a good balance between protection from the two types of ultraviolet radiation (UVA and UVB) and don’t often contain potentially harmful additives. Problems with the naturals: Yes, typically there is a white residue left on the skin, unless rubbed in really well. Tricks that many companies are coming up with are tinted sunscreen. Here is another important note related to sun (but not sunscreens!) MANY people stop their Vitamin D supplementation in the summer months because they feel they will get it from the sun. If you are wearing sunscreen, which you should be, you will not be getting Vitamin D. Your safest choice is to lather up, and supplement up! I don’t like the gym! I have a physical injury! How do I get around this? Fortunately, I live about 3 km from where I work. I have decided that for now, while my kids are little and still need a lot from me, walking to work gets me at least some exercise in. Yes, right now it’s not cardio, I’m not lifting weights, and it’s not perfect. But. It’s something. After the birth of my second daughter I found out I had a hernia and a diastasis. The two things have caused me some discomfort, but are not considered any sort of medical emergency. I have tried some yoga and some other activities, the end result being that they are ok as long as I modify. Still, I find myself, with wee kids, having trouble getting to a class once I am at home. My solution for the time being, until I can get the surgery to fix the hernia, and perhaps even until I feel less tired from the days demands, is walking. And it’s making a difference. My legs and core are getting stronger, and my extra baby weight is dropping off. Walking also allows me the time to get into the day’s groove, plan for my work day, organize my thoughts and feel ready when I walk into the office. At the end of the day it allows me the down time to process the day and shift from doctor to “mommy”. Even if you don’t live relatively close to work you can park your car further away, hop off the bus a few stops away. Choose to take the stairs not the elevator. Go for a walk at lunch time. Just getting started and integrating the activity into your everyday routine is the key. You don’t have to bench press hundreds of pounds or run a marathon. Good for you if you do, but if your hurdle is starting, if your hurdle is fear of the gym or that you won’t do the exercise right, or that you don’t have time, start simply. Go from there. For me, my next steps is to progress from walking, to biking in the summer, to start attending a regular yoga class again, like I did pre babies. But for now, I am gentle with myself, I do the best I can and make sure that I walk. I am finding more and more IV therapy lounges and Vitamin Drip shops are popping up all over the place. In these places you can decide from a menu and get a drip potentially without a full work up. I have had numerous people try to phone the clinic to get an IV drip without booking an initial consult. In my clinic, we require a consult first, for good reason. There are many types of IV therapies out there ranging from a traditional Myers cocktail to High Dose Vitamin C therapies, to Skin Healing therapies, and more. One may think that they can pop in and sit down, get a drip and go on with their day. But here is the thing. Injecting a Vitamin, Mineral, Herbal or Amino Acid into the vein can have side effects (from allergic reaction, to fluid overload, to blood cells bursting). An assessment of Liver and Kidney function need to be done, and for higher doses of Vitamin C, a marker called G6PD needs to be done to make sure your body can handle the treatment. Your overall health should also be assessed. Is this even the right therapy for you? Is there other avenues that should also be explored. IV therapy is part of a bigger protocol, not a stand-alone treatment. As an ND I want to see how you are eating, what supplements you are taking, what medications you are on, your sleep patterns, your lifestyle, etc. etc. All of this impacts the type of treatment you require. IV is sometimes recommended alongside other therapies, or as a fast track to improve health quickly, with a plan to move to oral supplementation afterwards. If after all of this and our safety standards are met, then I tailor the IV to you. Yes, there are sample recipes to follow, and sometimes a standard Myers or standard Vitamin C drip is what you will get; but generally, I will tell you, my patients typically end up getting formula unique to them, to meet their specific health concerns and unique body requirements. So, when you are thinking of this type of treatment, which can be absolutely amazing, make sure you are ready to embark upon a more thorough assessment. Make sure it is the right thing for you! 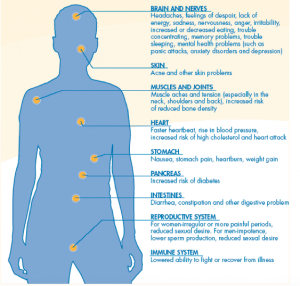 How does our body deal with toxins? Toxicant: Man-made (synthetic) substance that presents a risk of death, disease, injury, or birth defects in living organisms through absorption, ingestion, inhalation, or by altering the organism’s environment. 1. Our bodies accumulate toxins – from the air we breathe, the water we drink and processed/artificial foods we may eat. We also produce toxins as part of our regular metabolic processes – from exercise and especially stress. One of the main sources of these toxins and toxicants stems from our environment. 2. Prep the body for seasonal change: Your body naturally goes through some purging with the change of season to prepare itself for new climate conditions, seasonal food changes and new activities. However, because we don’t eat seasonally, ingest processed foods, and inhale pollutants our body struggles to make the changes on it’s own. A detox helps the body do what it’s supposed to do naturally. From a Traditional Chinese Medicine point of view, seasonal change, like any change, can cause stress. The main cause of stress in TCM is Wind. Wind is said to be the “agent of 10,000 diseases,” (The Yellow Emperor’s Classic of Internal Medicine). Wind is understood to be not just the movement of air, but also, any sudden change. Part of dealing with this seasonal stress is to consider foods we eat and help the body through this change. In the Fall, the TCM element is Metal. The associated and most effected organ in Fall are the Lung and Large Intestine. From a TCM standpoint, the lungs are an organ system that opens directly to the exterior. Because of the direct contact to the exterior, the lungs are easily susceptible to cold, heat, dryness, dampness, and most of all, heat and wind. The lung’s is also related to the large intestine. The large intestine controls the transformation of digestive wastes from liquid to solid state and transports the solids onwards and outwards. It plays a major role in the balance and purity of bodily fluids. A fall detoxification program would also be advised to help deal with the stress of going into a winter season. Because of the pairing of the lung and large intestine, a cleanse is certainly in order to help this process along. The low pH (acidity) of the stomach is fatal for many microorganisms that enter it. A detoxification plan should ensure your pH is where it needs to be. Part of the immune system that resides in the gut (containing IgA antibodies) neutralizes many of these microorganisms before they reach the blood. Health-enhancing intestinal bacteria serve to prevent the overgrowth of potentially harmful bacteria. With a detox, you are cleaning up your diet and promoting healthy elimination, thereby giving your first line of defense a good chance of catching those pesky bugs. Gastrointestinal health and gut permeability also play a role in detoxification. Increased gut permeability allows for increased absorption of xenobiotics and toxins, which are processed and removed by the liver, thus increasing the demands on the liver detoxification system. 4.Better Long Term Elimination: Functionally, poor digestion, colon sluggishness, reduced liver function, and poor elimination through the kidneys, respiratory tract, and skin all increase toxicity. Toxins also build up when our mechanisms of elimination are compromised. A detoxification program will help you safely eliminate these toxins and improve your health and well being. 5. Chance to educate yourself on becoming eco friendly: a detox for the body is a great thing to do, and part of it also involves looking at the rest of your environment. What products are you using at home and work? Are they toxic and can you find a healthier alternative? Making these types of changes will help you maintain a healthier you and a healthier household/work place. You have a pulse: joking aside, the air we breathe, the water and food we eat all contain a certain amount of toxins. By detoxifying a few times a year, you can avoid the long-term consequences of toxic build-up. Sleep disturbances or changes in energy level or mood. Alterations in weight, appetite and bowel function. Sexual interest and function change, in female any menstrual change. Alteration of hair growth and skin texture. Allergies typically show first – food and environmental. Chemical reactivity usually begins after other allergies. Note: A healthy whole foods diet encourages this process to happen (especially with your dark bitter green vegetables!). Talk to your health care practitioner about figuring out which kind of detox is right for you! !